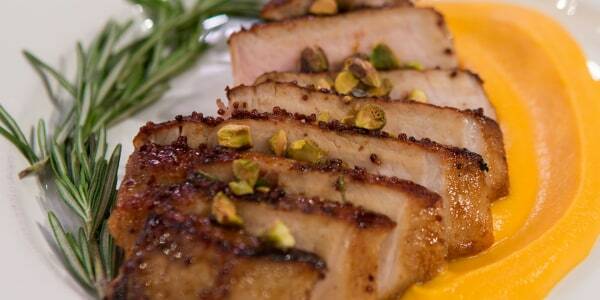 Learn how to cook butternut squash that guests will gobble up on Thanksgiving. A sweet addition to fall and winter's seasonal lineups, butternut squash is a versatile vegetable that can make its way into almost any hearty cold-weather meal, from a creamy soup to a hearty lasagna. Its flavor profile pairs beautifully with so many ingredients, including garlic, sage, smoky chile seasoning and rich maple syrup. The gourd is also a popular item to serve on Thanksgiving and is often prepared as a side dish on the holiday. Whether it's roasted, baked, sauteed, steamed, pureed or mashed with butter, it's a terrific sweet and savory accompaniment to turkey. Here's how to cook butternut squash in six different and delicious ways. Preheat the oven to 400 degrees and line a large baking sheet with parchment paper. Toss 2 pounds of peeled, cubed squash with 1½ tablespoons of olive oil, ½ teaspoon of kosher salt and ¼ teaspoon of black pepper. For some heat, consider adding in ½ teaspoon of chile powder, too. 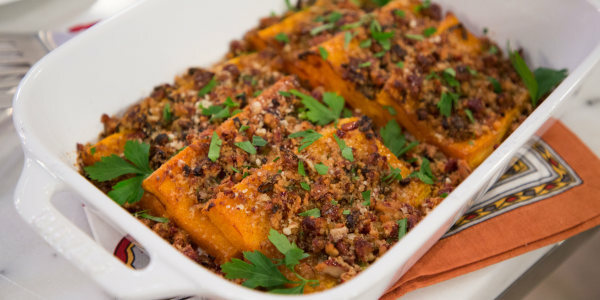 Place the butternut squash in a single layer on the baking sheet. Roast it for 25-30 minutes, stirring halfway through the cooking time, until the butternut squash is tender and golden brown at the edges. Preheat the oven to 350 degrees. Slice the stem end off of a 2- to 3-pound unpeeled squash. Halve the squash lengthwise. Scoop out the seeds and place the halves cut-side down in a 9-by-13-inch baking pan. Pour enough water into the pan to just cover the edges of the squash. Bake for 1 to 1½ hours, until the squash is very soft and tender. It is done when a paring knife inserted into the squash neck meets no resistance. Discard the skin and season the squash to taste. In a large (12-inch) skillet or saute pan, heat 2 tablespoons of olive oil over medium heat until it is shimmering. Add 2 pounds of peeled and cubed butternut squash and stir to coat the squash with the oil. Cook for 15-20 minutes, stirring occasionally, until the cubes are tender and browned in spots. For additional flavor, when the squash is nearly tender, stir in 1 minced garlic clove and 1 teaspoon of minced fresh sage. Cook for 1-2 minutes more. Season with salt and ground pepper to taste. Fill a large saucepan with 1 inch of water and place a steamer basket in the pan. Cover and bring to a boil over medium heat. Add 1½ pounds of peeled and cubed butternut squash to the basket. Cover and cook until the squash is tender, about 15 minutes. Season to taste. 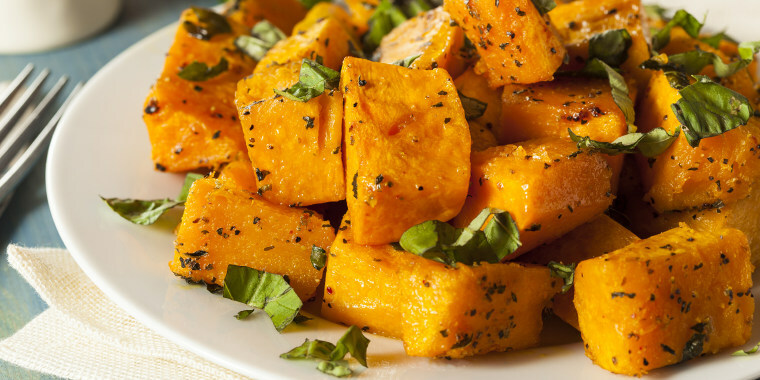 In a food processor or high-powered blender, add 2 pounds of freshly baked or steamed squash. Pulse until a smooth puree forms, scraping down the sides of the bowl as needed. The butternut squash puree can be added to pasta dishes like mac and cheese or lasagna. 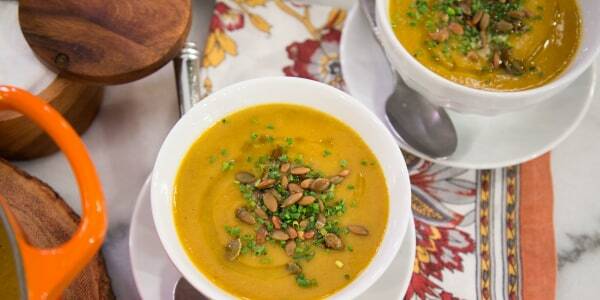 It can also be used as a base for a creamy butternut squash soup. 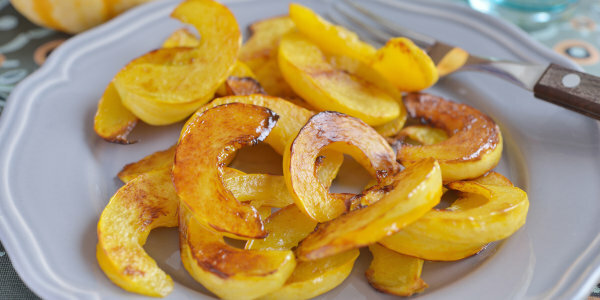 In a large bowl, add 2 pounds of freshly roasted, baked or steamed squash. Mash with a potato masher, then stir in ½ cup of room-temperature cream, 4 tablespoons of melted butter and ¼ teaspoon of freshly ground nutmeg. Add salt and ground pepper to taste. For more ways to cook and serve the gourd, check out these 15 delicious butternut squash recipes.